I’m reading between the lines here, but what do you think it means when the Italian government plans to take control of Alitalia (once again) in order to build a flagship airline of “Italo character”? Alitalia is heavily in debt and its current “administration” (there have been too many to count) faces a December deadline to re-pay creditors. 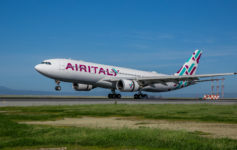 The government plan would see Italy take (re-take to be precise) a 51% stake in the flag carrier and work with a private partner to make the airline profitable again. How? That’s anyone’s guess. Lufthansa has been named as a prime candidate for this public-private partnership. The goal is to create a national carrier with an “Italo character”. Recall that Lufthansa had a subsidiary company, Lufthansa Italia, based in Milan Malpensa and operated routes across Europe from this mini-hub. Like aviation in general in Italy, the carrier lost money and suspended that hub in 2011. But there’s more to the story. I’ve noted the huge route expansion of Air Italy, the re-branded Meridiana. Qatar Airways owns a 49% stake in they carrier and is driving business away from Alitalia with its new short- and longhaul routes. When the Italian government talks about “Italo character” it seems clear to me it means only one thing: we don’t like the influence Qatar has on Air Italy. If not, why not bolster Air Italy, which has an eager partner in the form of Qatar Airways, by letting Alitalia die? If we give the Italian government the benefit of the doubt, I see this logic: Etihad came in, poured millions into Alitalia, lost €1.3 million per day, then cut and run…leaving Alitalia days from liquidation. Without the government’s help, Alitalia would have collapsed, creating a huge ripple effect in the Italian economy. If Alitalia goes under and we are left with Air Italy only, will Qatar Airways pull the same stunt when its Air Italy investment turns upside down? Here’s the logic deficit, through. Alitalia loses money every quarter. Its entrenched labor unions and fierce competition from across Europe have made it the odd man out. I understand the multiplier effect Alitalia has on the Italian economy, but doesn’t there eventually reach a point where enough is enough? How much is every job worth when the government is pouring hundreds of millions into bailing out the company through “bridge loans” that are unlikely to ever be fully repaid? We will bring the company under the national flag, with 51 per cent in Italy and with a partner that makes it fly. I do understand that re-nationalizing Alitalia was a campaign promise of the Five Star Movement and that there is legitimate fear Qatar will pay the same trick Etihad did if Air Italy starts posting consistent losses. But the Italian government might wish to consider that competitors to Alitalia will never succeed if it continues to feed Alitalia. At least let’s hope they’ll bring back their Malpensa hub. I don’t see them making any money with the Rome hub alone. It is not a stunt when a business makes a financial decision to stop funding losses. The investment was not made with the purpose of pulling the plug but in the hope of financial success. The whole Alitalia thing is purely political and not business at all. Otherwise, as you say, why not promote Air Italy as the flag carrier?